Since I've officially made the decision to move into my own apartment come mid-July/August. I haven't really been able to think of anything else. I've been scouring Pinterest for ideas for my living room. I'm 100% happy with my bedroom decor and don't plan to change anything in there (except for maybe the bookshelf I currently have). So I get to focus all my attention and budget on the living room and kitchen. That is wear Pinterest comes in. 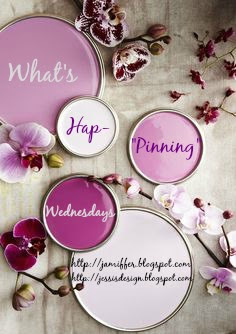 For this edition of What's Ha-"Pinning" with Jenn and Jessi I'm sharing the inspirations I've found for the living room the new apartment! The apartment is going to be pretty small. 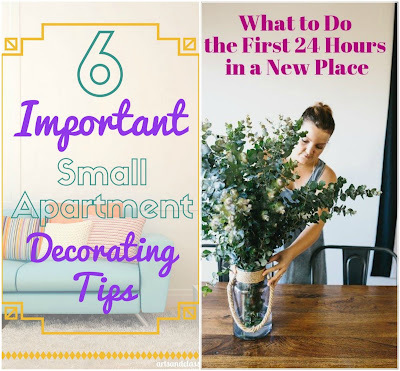 Seeing as it will just me and the fur babies, so I've found a few websites and blogs that have given some helpful decorating tips for small apartments. And that second pin comes with some great advice as far as what you should be sure to unpack and set up in the first 24 hours of moving into your new apartment. The new place is hopefully going to be on the second level with stairs leading from the attached garage to the apartment itself. And there is a huge wall along the staircase, so I plan to use that space for a gallery wall. That is where pin number three comes in. 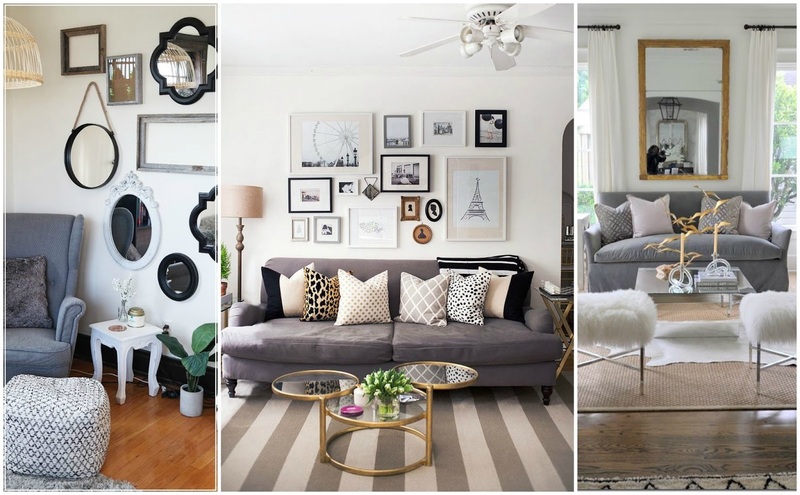 I love the way all these different shaped mirrors and empty frame fill the space. I also plan to have a large mirror of some sort in the living room like you see in pin 5 because I've read that adding a mirror is great way to make it look like you have a bigger space. As I've already mentioned I plan to get a new bookshelf for my bedroom and it will probably like the one in pin nine. Only just half that with 8 selves not 16. I like the versatility of this book shelf (it's from IKEA). You can use it to display books and fun accessories or you can put boxed in them for extra storage. I'm OBSESSED with the shelf in Pin eight. This is actually another IKEA shelf that has been spray painted gold. I love the combination of grey, gold, white, and black with a pop of color here and there. And that is the color scheme I plan to go with. I think this shelf will fit in perfectly with that. I also plan to put in some shelving units about my desk area, which will also be in the living room and I love the styling elements in pin six. As far as coffee tables go these are my inspirations. 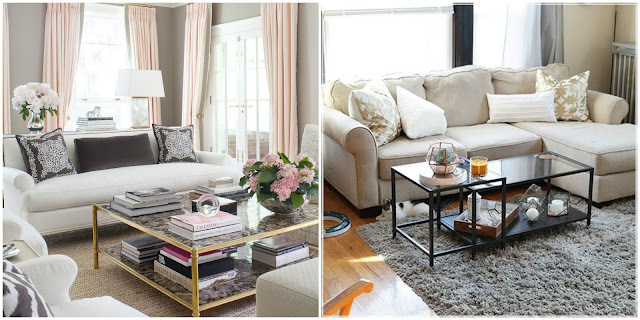 I loved the coffee table and styling in pin eleven, this is actually Lauren from The Lauren Elizabeth's living room. 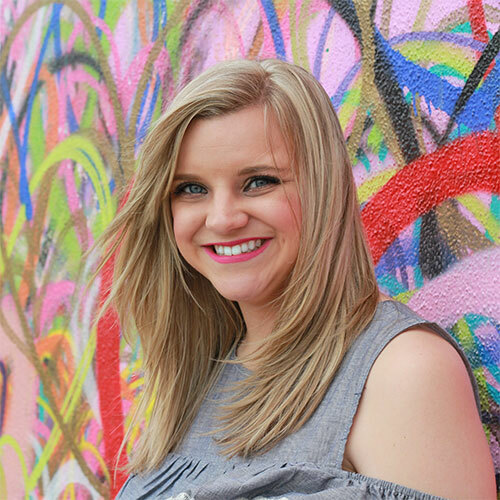 I've been following her blog for a few years and she is amazing at decorating. It's funny because when I saw that coffee table (pin eleven) on IKEA's website I thought to myself, "Man, I would never think to buy this myself." But then I saw the different options for styling and I was sold. This is actually two different pieces that are stacked together. So you can always separate them if you need an extra side table or you can use them together. So I bought it last weekend! :) I'm leaving it in the box until I move in so that way it's one less big piece of furniture I have to move. It has taken all I've got to now go crazy buy decor items for the living room right now. But I do plan to buy things throughout the next few months so I'm not spending crazy amounts of money right as I'm also paying to set up everything in the apartment itself. That way there is less stress on my wallet. But seriously y'all I am so stinkin excited! I cannot wait for this next big step in my life and I am SO THANKFUL for Pinterest. I don't know how people decorated or did pretty much anything before it! Fingers crossed the vision in my head and on my Pinterest boards comes to life! I love ALL of these ideas!! It all looks cozy and chic! Can't wait to see what you put together once you move in! I love all of the bookshelves that you chose for your inspiration! I still want to get a few for our house that we can put books into, along with other cute little knick knacks.